Please indicate which weekend(s) you're signing up for. 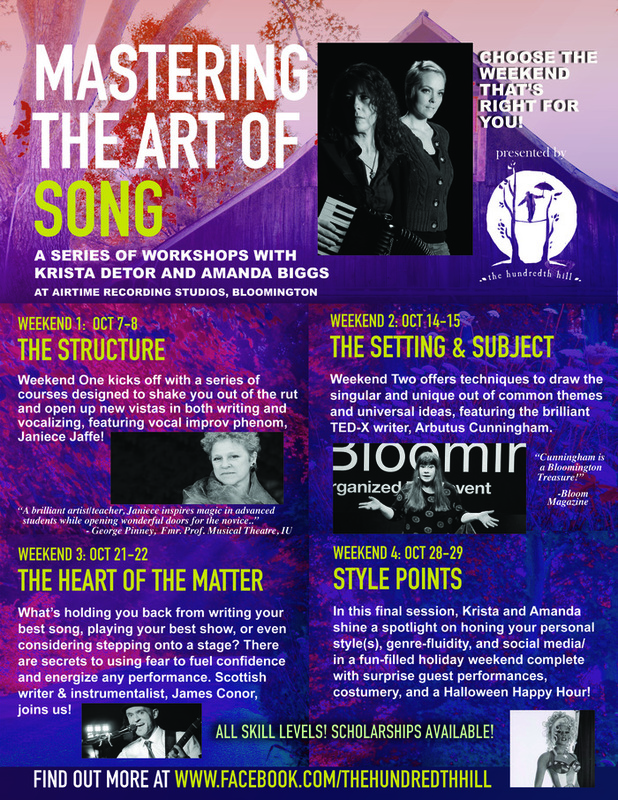 Krista Detor and Amanda Biggs team up to present a series of weekend masterclass workshops, designed to take your songwriting and vocal performance to new heights and possibilities. Set at the beautiful Hundredth Hill Arts Retreat Space, home of Airtime Recording Studios, The weekend sessions include gourmet lunches, special guests, and one-on-one time with world-class instructors. Join us for a weekend or the entire series. We promise - we'll get you on the road to mastering the art of your song. We have full and partial scholarship packages available. Please send a note to: TheHundredthHill@Gmail.com - and let us know a little bit about yourself, what weekend(s) you're interested in, and the level of scholarship that best fits your circumstance. For scholarship and other information, contact us at: TheHundredthHill@Gmail.com, or call/text (812)360-5434.